[Manchester]: [Co-operative Printing Society Limited], [1904-1911] 31 issues, comprising issues 1-24 issues of Vol. I and 1-7 of Vol. II. 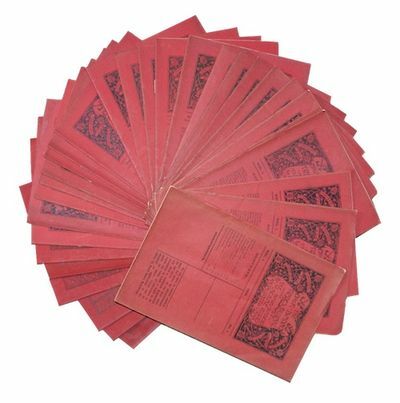 Original publisher's printed red paper wrappers, housed in recent custom box of gilt-tooled red half-morocco, marbled sides and edges. Occasional slight chipping to extremities, light rubbing to box. Internally clean and crisp. A richly illustrated and informative trade bookbinding periodical. Initially issued by the Bookbinders and Machine Rulers' Consolidated Union of Manchester, and later by the National Union of Bookbinders and Machine Rulers (from Vol. II, No. 5 onwards), the publication continued until 1914 - concluding with Vol. II, No. 16. In addition to revealing the workings of the early twentieth-century bookbinding trade, this fascinating periodical provides practical advice regarding all manner of materials and techniques, including examples of the work of renowned craftsmen such as Sangorski, and reviews of contemporary styles such as art nouveau. In 1911 the Bookbinders and Machine Rulers' Consolidated Union amalgamated with the London Consolidated Society of Journeymen Bookbinders and others to form the National Union of Bookbinders and Machine Rulers. The origins of this trade union date to 1835 when numerous bookbinder societies had merged to create the Bookbinders' Consolidated Relief Fund; an organisation established both to assist those craftsmen 'tramping' in seek of work and to promote the overall betterment of conditions for journeymen bookbinders. The union became by far the largest in the nation, with approximately 2900 members listed at the turn of the twentieth-century. . First edition. 8vo.